It is the un-official start of the summer season so if the weather would cooperate it might just feel that way. Well this drink could help you kick off Memorial Day Weekend whether you’re inside or outside. This is a light cool drink for when the weather turns warm. Sangria and Summer! Perfect to make for a large crowd, easy as could be and light because it’s made with sugar-free Lemonade . If you don’t want to use sugar-free just use regular lemonade, it’s no problem. I remember making Sangria and it was messy and required a lot of different ingredients plus a lot of sugar. 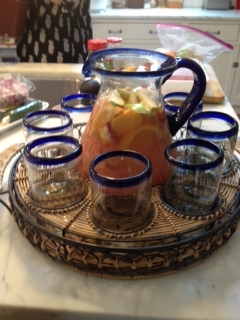 My friend Carol has been making this for years and I have called upon her many times to re-create this Sangria. It can be made with white or red wine. It makes 2 quarts without ice, so that goes a long way . You can cut up whatever fruit you like , peaches are beautiful , oranges, apples, pears, strawberries whatever you like. I like to make the Sangria in the afternoon just so the fruit gets the full flavor of the wine and marinates for at least a few hours. It’s not critical though. I think you’ll like this one. Again, thanks Carol so much for sharing and promise I won’t annoy you anymore now that I have it written down . 1 Bottle Wine Red or White ( I used Pinot Grigio but you can use whatever you like or have) I wouldn’t use a very expensive bottle for this. Fruit of your choice , peaches , pears, oranges, nectarines, apricots, apples ,etc. I slice into thin slices which are easy to eat . Slice them up and eyeball it. Whatever you like, I used peaches, apricots, apples and oranges . 1 packet Sugar Free Wylers or Crystal Light Lemonade , I use Yellow Lemonade for White Wine and Pink Lemonade for Red Wine , if you’re opposed to using sugar substitutes you can certainly use fresh lemonade. You’ll need a 2 quart pitcher, I use a nice glass pitcher . It can be kept for a while in fridge in a plastic 2 quart container. Sometimes for a very large gathering I make an extra one and keep in refrigerator without the fruit, just as a back up. Cut up fruit into slices/pieces for Sangria. I take a 2 quart pitcher pour in the bottle of wine, put in the packet of Wylers or Crystal Light, add the Club soda almost up to the top of the container or pitcher leaving room for fruit, so you may not need whole bottle . Add fruit and Stir, I usually add the rest of the club soda after fruit goes in . Put in refrigerator and let flavors meld together for a few hours and get cold. Serve in glasses with ice, you can add additional fruit like raspberries at the time you serve. It’s delicious , refreshing, low in calories and did I mention super easy??? This entry was posted in alcoholic beverages, Sangria and tagged Light Summer Sangria, Sangria, Sugarfree Sangria, Summer Sangria. Bookmark the permalink.